SHANGHAI, CHINA--(Marketwire - April 19, 2010) - Welcoming the season of Spring and the approaching World Expo 2010, a brand new Japanese restaurant at Shanghai Marriott Hotel Changfeng Park opened its door to the world today. Consul Generals from Japan, Mexico, India and Egypt came to witness the memorable moment and 5 media from Shanghai and the world came to celebrate the opening of this beautiful hotel near Shanghai Zhongshan Park. As the name suggests Sakitori is all about Japanese charcoal grilling and, on opening night, contented patrons named it the best Shanghai Putuo District restaurant. The outlet's main feature is the 10 meter continuous long Sakitori grill that runs down the center of the outlet. The menu features over 30 different types of skewered meats, vegetables and seafood. 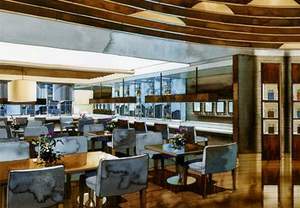 The general restaurant design is modern with everything flowing out from the center island Sakitori grill/kitchen. Guests can sit around this space at a low bar and watch the chefs in action. The hotel near Shanghai's Suzhou River features more than 20 kinds of Saki representing different areas in Japan. Chairs are standard height with a chunky wooden look. 3 semi private rooms are located at each end of the outlet; these are complete with their own cook, Sakitori grills being built into the center of each table. Lighting is used to highlight the different natural textured materials that have been used in the outlet. Flooring is rough stone and semi exposed ceiling with pin spot light on key focus points within the outlet. Located on the second floor of the Shanghai Suzhou River hotel, Sakitori welcomes guests coming to enjoy the elegant Japanese traditional environment, tasting the exquisite Japanese delicacies and experiencing the year of Shanghai World Expo 2010. As the name suggests Sakitori is all about Japanese charcoal grilling and, on opening night, contented patrons named it the best Japanese restaurant in Shanghai.